The iRacing dirt track list continues to grow. Meet the iRacing Volusia Speedway Park addition. The video below shows the latest content announcement in action. (Mar 2) – iRacing.com today announced plans to add Volusia Speedway Park to its catalog of nearly 100 laser-scanned digital race tracks. Together with Eldora and Williams Grove speedways, the Florida half-mile will be included in the popular online motorsports service’s introduction of its new dirt racing feature later this year. Known as “The World’s Fastest Half-Mile,” Volusia Speedway Park is located in Barberville, FL. Since opening in 1968 the track has hosted a variety of national racing series. The track made the switch from pavement to dirt in the 1990s and hasn’t looked back since. 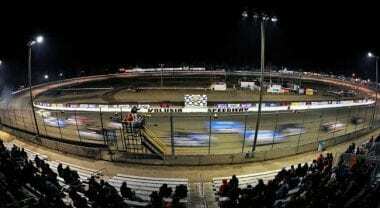 Race fans around the world know it as host to the season kickoff DIRTcar Nationals each February. The DIRTcar Nationals features the World of Outlaws Craftsman® Sprint Car Series, World of Outlaws Craftsman Late Model Series, Super DIRTcar Series Big-Block Modifieds, Arctic Cat All Star Circuit of Champions and DIRTcar Racing UMP Modified and Late Model divisions during the 12-night blockbuster event before the track shifts gears to a weekly program for Florida racers. “We’re excited to join the other great race tracks on iRacing.com,” says Volusia Speedway President Tom Deery. “Volusia Speedway Park will be a great addition to our lineup,” says Steve Myers, Executive Vice President and Executive Producer for iRacing.com. iRacing’s extensive inventory already includes nearly 100 speedways, short tracks and road courses, as well as dozens of precisely-modeled stock, sports and open wheel racing cars, including the Chevrolet SS, Ford Fusions and Toyota Camrys raced in the Monster Energy NASCAR Cup Series, GT3 cars, sports prototypes, Formula One and IndyCars.